Fayette Teacher of the Year finalists (L-R) Fayette County High math teacher Bob Spiller, Starr’s Mill High English teacher Jillian Bowen, and Robert J. Burch Elementary third grade teacher Michael Wamsley. Photos/Fayette County School System. This is the moment Fayette County has been waiting for, the Fayette County Public School System has named the three finalists in the running for Fayette County’s 2019 Teacher of the Year. 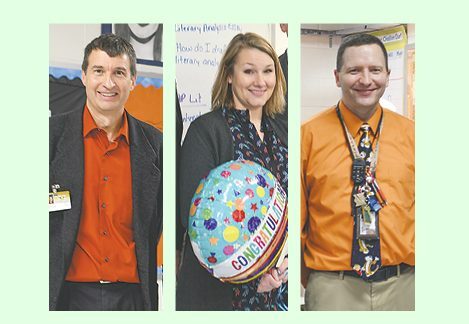 The finalists for the 2019 Teacher of Year honor are Bob Spiller, Fayette County High; Jillian Bowen, Starr’s Mill High; and Michael Wamsley, Robert. J Burch Elementary. As a decorated veteran of the United States Army and Army Reserves, Fayette County High’s math teacher Bob Spiller has always believed in the importance of relationships. It’s no wonder why after 27 years as an educator, Spiller continues to uphold the value of relationships with all of his students, “Positive teacher-student relationships enable me to avoid the power struggles and discipline issues that have a negative impact on learning,” he says. Spiller believes one of the most important lessons he can teach is not entirely about math and numbers, but about helping his students understand the relevance of math in their day to day lives. Each year, Spiller teaches his students about exponential functions by sharing a personal story from his life in the military. For Spiller, teaching is not about giving a lecture and a test, but it’s about students taking the lessons and applying the learning to their personal lives. “While change and growth are painful, we must all drive and embrace change so that our students may accomplish their dreams. Our focus must be to invest in what is right with education and in initiatives that will support teaching and learning,” says Spiller. With 27 years in education, Bob Spiller has spent 17 years of his teaching career at Fayette County High School. Hook, line, sinker – all it took was one day working as a substitute teacher for Jillian Bowen to decided teaching was her passion. Bowen is an English teacher at Starr’s Mill High who strives to challenge her students each and every day to be the best they can be. As a firm believer in student-centered classrooms, Bowen creates lessons where students are active participants from the beginning of class rather than the teacher being the center of attention and information. Servant leadership is the heart of what drives Michael Wamsley, a third-grade teacher at Robert J. Burch Elementary, to inspire, challenge, and create a passion for learning in his classroom every day. Before learning can take place, Wamsley believes in creating a classroom full of positive and meaningful relationships, “They do not care how much you know until they know how much you care,” he says. Wamsley strongly believes one of the best ways for his students to learn is through hands-on learning; each year, he transforms his classroom into North America where his students are explorers and must face various challenges during the age of exploration. Students discuss the motivation behind their actions, the obstacles they faced, and what they would do differently in the future. This is not only a school lesson, but a life lesson, “Students learn to take risks and show confidence in their ability to solve problems, while developing analytical and creative thinking that transfer over to real life scenarios,” Wamsley says. Understanding the tremendous stress student’s face outside of the classroom, Wamsley wants his classroom to be the place students can experience a safe and supportive community that encourages and lifts up others. Each day begins with Wamsley personally greeting each of his students and ends with his students sharing a positive action they saw throughout the day. Every day is celebration in his classroom. Wamsley has been an educator for 16 years and has taught at Robert J. Burch Elementary for two years. To determine the 2019 Fayette County Teacher of the Year winner, the finalists will be observed in their classrooms and interviewed by the judging panel, which consist of two retired educators and last year’s county winner, Natalia Nizker of Robert J. Burch Elementary. The teacher with the highest combined judges’ score will be named the 2019 Fayette County Teacher of the Year. The winner will be announced at the annual celebration on April 11 at New Hope Baptist Church, South Campus, starting at 6 p.m. This event is free and open to the public.